Serbia’s largest aggregates producer will expand its fleet of heavy equipment with new equipment from Finnish engineering company, Metso. Teko Mining will add additional crushing and screening equipment at two of its four quarries in the southeast European country. Teko Mining produces around 3 million tpy of various stone materials for the development and construction of infrastructure in Serbia. The new units will be delivered to the Straževica and Ceramide operations and have an order value of €2.4 million. “Teko Mining has quarries where many Metso units are already in operations, and we have been highly satisfied with the equipments and aftersales support Metso has delivered,’ said Uros Veljic, General Manager at the mining company. "Today, our quarries operate in three shifts and we face challenges to produce enough material to meet the demand. With the new plant, we will be able to produce the required volumes running in a single shift. In addition to the higher quarry outputs, we will be able to reduce waste and produce higher quality aggregates," Veljic continued. 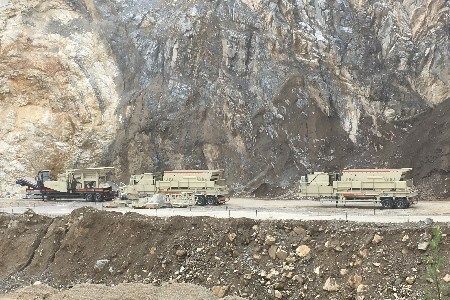 The Straževica quarry will receive a Premier CVB202P inclined screen, a NW1213 portable impact crusher, and two MW2060 portable screening plants. The oder also includes a Barmac B6150E vertical shaft impact crusher on skids, dedusting equipment, steel structures, and conveyors. With the new equipment, the quarry’s capacity will increase by about 300 tph. In addition the Ceramide operation will be upgraded with two new Premier CVB screens.